ABBEYFEALE ON LINE! : IRELAND LAND WORLD SILVER! 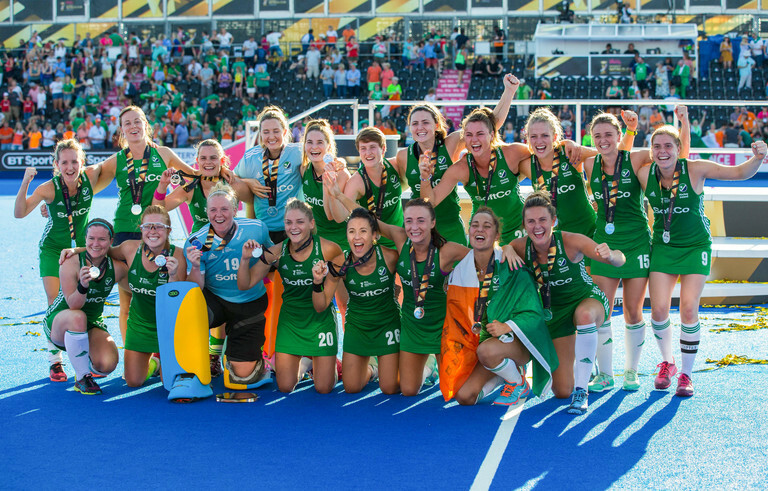 Congratulations to the Ireland Ladies Hockey Team who won silver at the World Cup finals in London at the weekend. Limerick will play Galway in the All Ireland hurling final in Croke Park on next Sunday week, 19th August. The Tribesmen recorded a narrow one point win over Clare in a thrilling replay at the weekend. Limerick will be attempting to bridge a 45 year gap to their last All Ireland senior success in 1973. They have won seven titles to date. Galway are the present All Ireland champions and are hoping to retain their title. They have won the competition five times. Bookmakers make Galway 4/7 favourites with Limerick on offer at 13/8. 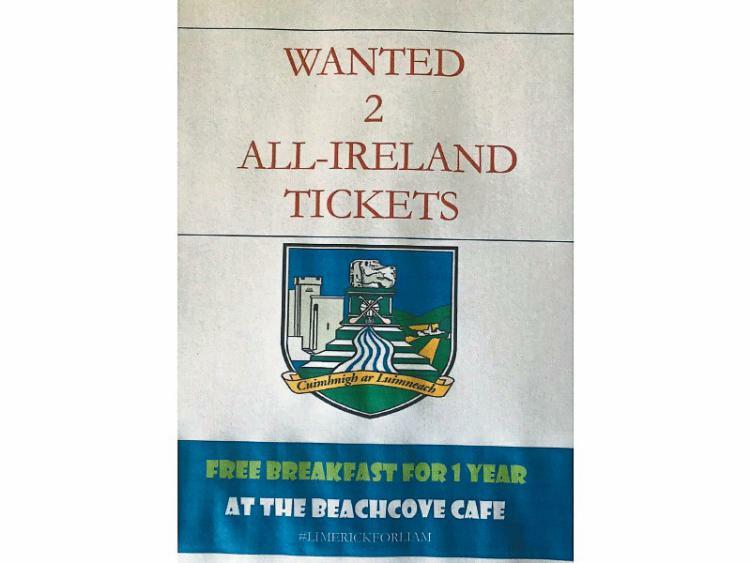 THE LIMERICK owners of a café in Kerry are offering free breakfast for a year to whoever can give them two All-Ireland final tickets. The Beach Cove Café in Waterville was taken over by Limerick couple Paula O’Mahony and David Gorey in June. The tempting offer of a year’s free breakfast was stuck up on the window of the café and posted on its social media channels this weekend. “We decided we really needed tickets as we haven’t had a day off since we opened,” said Paula, who is from Bruff. Her husband David is from Castletroy. DEPARTING Kerry manager Éamonn Fitzmaurice has said he hopes his successor will be allowed "time and space" to achieve success after what he called a "negative atmosphere" surrounding the players lately. Fitzmaurice saw his team beat Kildare by 12 points in their final Super 8s game this evening, but Monaghan’s victory in Salthill ensured Kerry’s exit, with the 2014 All-Ireland winning manager confirming his resignation after six years in charge. The Finuge native, who won three All-Ireland titles as a player and guided the Kingdom to six successive provincial titles, says the moment has come to step aside. DEATH; The death has occurred of Geraldine LYONS (née O'Donoghue) Shanbally, Abbeyfeale Sympathy is extended to her bereaved husband Denis, son Denis, daughters Marie and Nicola, grand-daughters Adriana and Annalise, son-in-law Seán, daughter-in-law Susanne, brothers, sisters, brothers-in-law, sisters-in-law, nephews, nieces, relatives and friends. PROLOGUE: "Everybody is a genius. But if you judge a fish by its ability to climb a tree it will live its whole life believing that it is stupid." CHURCH NOTES: Canon Anthony Mullins 087/2600414. Fr Joseph Foley CC Tel: Mobile: 087 – 2618412. Fr Brendan Duggan 087/0562674 Parish Office: Parish 068/31133 Open 11:00 – 1:00 p.m. Tues. - Fri. Email: fealechurch@eircom.net Limerick Social Services: 061-314111 Accord NCW 069/61000. . Parish Church 068/51915. Limerick Social Services: 061-314111. A.A. 061-311222 Al-Anon 086-8143425 Bereavement Support: 068 / 31203, 068/ 31262, 068/5198. Parish Support Worker 068/31019. St Vincent De Paul 087/1213560. 087 – 2618412. To book a Mass intention telephone the church 068/51915 during Mass times. Counselling Appointment 061/314213. Accord NCW 069/61000. Samaritans: 061 - 412111 or Free phone 1850609090 061-306792. Masses: No morning Mass Monday, evening Mass at 7pm. Saturday Masses 11am and 6.30pm. Sunday 9.15am and 12 noon. Mass Intentions: Saturday 11am John Horgan, Killarney Road 2nd Anniversary. 6.30pm Mary & Maurice Nash and daughter Rita and son Micheal. Ann Fitzgibbion, Caher. 5th Anniversary. Prayers to St Anthony on Mondays during the 7pm Mass. Novena to Our Lady of Perpetual Help on Fridays during the 10am Mass. Counselling takes place every week in West Limerick Tel 061/3147213 for appointment. A basket for the collection of stamps for Peru is at the back of the altar. If you know of someone in hospital please notify Fr. Tony. NATURE WALK: West Limerick Resources, in conjunction with Living Limerick and Feale Biodiversity, are hosting a nature walk on Saturday, August 11 at 11am. The starting point is Halla Inse Bán, Templeglantine, and it will be carried out by local biodiversity expert Anneke Vrieling. All are welcome to attend! ELEANOR MC EVOY IN CONCERT AT THE GLÓRACH: Eleanor McEvoy the Irish singer/songwriter who composed the song "Only A Woman's Heart" will perform at the Glórach on Friday, August 31 at 8.30pm. Her new album "The Thomas Moore Project" was launched in Ireland’s National Concert Hall and features 21st century adaptations of the songs of the 18th/19th century Irish poet Thomas Moore. It became RTE 1’s album of the week the week it was released and received rave reviews in Ireland, Hot Press magazine saying “McEvoy has re-established the relevance of one of Ireland’s most important yet most besmirched national artists” and the Irish Times describing it as “a highly evocative collection” Tickets €20. Bookings on 087 1383940. AFTERNOON TEA DANCING: A Tea Dance will be held at Fr Casey’s Abbeyfeale on Sunday, September 9 from 3 - 6pm. Music by The Billy O Brien Band and guests Big Maggie and Mike Mini Moore. Teas served, raffle, proceeds to Space for Shane. ADVICE FROM COMMUNITY ALERT: Abbeyfeale Garda Station 068 30010 (if station unattended the call will automatically be forwarded to NCW station 069 20650. Helpline for crime victims is 116006. Opening hours are; M! onday, Wednesday and Friday 10.00 – 5pm, Tuesday and Thursday 9.30 – 6.30pm, Saturday 2 – 4pm.Sunday- Closed. Never, ever give banking details to anyone on the phone or at the door. Lock windows and doors even if you are only going out for a few minutes. Put handbags in the boot not the passenger seat and lock the door when you’re in the car. Wear sunscreen, have the container beside the Holy Water and apply both on your way out the door Once you reach the age of 65 and live alone or with a person/s aged over 65 you are entitled to receive a monitored alarm system. But if you have younger people living in the house who are out for long periods of the day then because you are spending hours alone you are also entitled to the system provided that you are over 65. The free equipment is provided by Pobal following an application from Abbeyfeale Community Alert, there will be a monitoring fee to be paid from the second year of installation to the installing company of €66. Should you not have a landline the installing company Task provide a sim card at a rate of €7.50 per month. Please note that this fee is payable in a lump sum each year after year one. Committee members are Sean Broderick, Micheal O’Kelly N.T., Seamus Stack, Mossie Gleeson, Kathleen Collins, Mary McArthur, Buddy and Brenda Barry, John O’Sullivan, Billy Quirke N.T., Cllr. Francis Foley, Mary Jo O’Connell, James Joy, Denis Collins, Marian Harnett. FAIR DAY: The annual Fair Day takes place in Kenmare, Co. Kerry on Wednesday, August 15 from 7am. It’s always a great day out. ANNUAL PADRE PIO CEREMONIES: commemorating his Ordination to the Priesthood in August 1910 will be celebrated in the Church of the Holy Spirit, Dennehy’s Cross, Cork at 2.30pm on Sunday August, 12th. COMMEMORATION: To mark the 125th Anniversary of the Shannon Drowning of 1893, Tarbert Historical Society will stage a living history enactment of the tragic event in the green area at the Bridewell. This will involve the participation of boys and girls from Tarbert National School and will take place on Wednesday, August 15 at 7pm. This will be followed by the official opening of the newly designed Memorial Plaza. Officials from Kerry County Council and Councillors will attend. ARDAGH COMMEMORATIONS: On Thursday August 23 a talk by Dr Bill O’Brien U.C.C. will be held in the Community Centre at 7.30pm. The title is Ballylin Hill Fort the Bronze Age Capital of Limerick and it will be followed by tea and cake. This event is in association with Heritage week. KILLARNEY LIBRARY will host a workshop (using filmmaking techniques to bring an image of a book to screen) entitled From Page to Green Screen for children age 9-12 on Saturday, August 11 at 11am. Free admission but prior booking essential on 064-6632655.